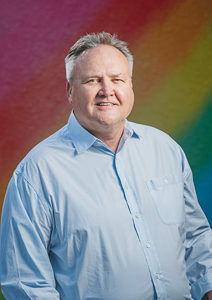 Roark Clayton is owner of The PrintingWorks, a commercial printing company located in Sunnyvale since 1976. The PrintingWorks serves a variety of companies and non-profits in Silicon Valley, fulfilling their print media requirements. Corporate stationery, brochures and business cards are a few of the items produced. Roark resides in Willow Glen with his husband, Gil Mendez and their two Scottish Folds, Danny & Ailie. Together they enjoy entertaining family and friends, gardening and spending time at their vacation home in Puerto Vallarta.